You can use your Bluetooth-capable Xbox Wireless Controller to play games on the Samsung Gear VR, Powered by Oculus. Before you start, make sure your Xbox Wireless Controller is Bluetooth-compatible and has the latest update. See the Troubleshooting section below for more information. Turn on your Xbox Wireless Controller and the Android device. Press and hold the Bind button for 3 seconds and release. On your Android device, go to Settings > Bluetooth. Turn on Bluetooth and select Scan. Select Xbox Wireless Controller from available devices. Your device should now show as paired under Paired devices. Connect your phone to the Samsung Gear VR and confirm Bluetooth is switched on. Press and hold the Back button. If your controller is connected but not working in the game, install the latest updates from the game publisher. The Xbox Wireless Controller does not support any attachments, such as headsets, Xbox Chatpad, or the Xbox One Stereo Headset Adapter, while connected via Bluetooth. Using an Android device to update your Xbox Wireless Controller is not supported. Getting the latest controller update requires a PC running the latest Windows 10 update. See Windows Update: FAQ to learn how to get the latest update. Updating your Xbox Wireless Controller firmware over Bluetooth is not supported. If you’re not sure, look at the plastic around the Xbox button . On Bluetooth-supported controllers, the plastic surrounding the Xbox button is part of the face of the controller. On controllers without Bluetooth, the plastic is part of the top, where the bumpers are. 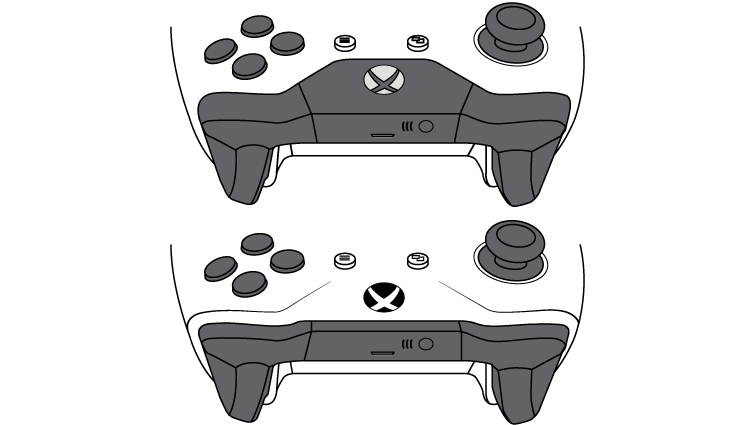 Your controller has the Bluetooth feature if it looks like the one on the bottom in this illustration. Follow any one of the three options below to update your Xbox Wireless Controller. Make sure you have the latest system update by going to System > Settings > System > Updates & downloads. Install the update if one is available. Make sure you have the latest controller update by going to System > Settings > Kinect & devices > Devices & accessories. Select the three dots to see if there's an update available. If so, install the update. Make sure you have the latest system update by going to System > Settings > System > Updates & downloads Install the update if one is available. Plug the big end of the USB cable into the USB port on the console. Instructions to install an update will automatically appear if one is available. Install the update. Update your PC to the latest version of Windows 10. Launch the Microsoft Store and enter the search term "Xbox Accessories." Then select Get to download and install the app. Open the Xbox Accessories app by selecting Launch once it has finished installing. Connect your Xbox Wireless Controller by using a USB cable or the Xbox Wireless Adapter for Windows. You'll see the message Update Required if an update is mandatory. Install the update. This will work with all controller-compatible games on Samsung Gear VR. To see if the game is compatible with controllers, check the app description page in the Oculus store. Go to Set up your Samsung Gear VR for information on setting up your device. Go to Samsung Support for help with your Samsung device. Go to the game publisher’s site for support. I have questions about or need help with my Xbox Wireless Controller. What should I do? Follow the steps above to make sure you’re set up properly. 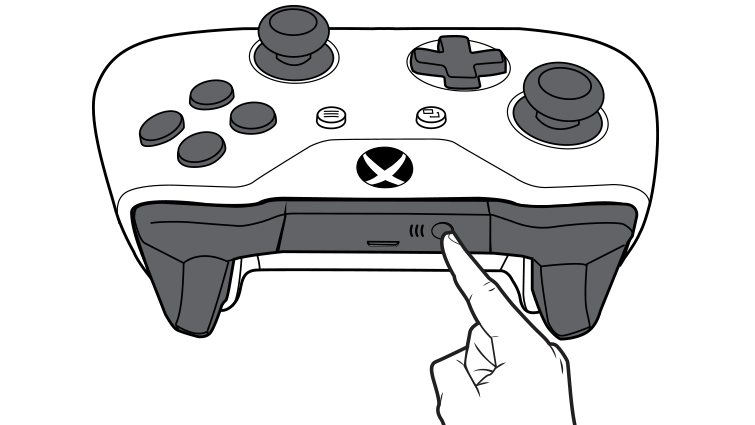 If that doesn’t fix the issue, go to Standard Xbox One Wireless Controller overview for “how to” and troubleshooting information. If the technology that makes this work is Bluetooth, does that mean I can pair an Xbox Wireless Controller with any Bluetooth-enabled device? Right now, only select Samsung Galaxy devices are supported. In some cases, you may be able to pair and use the controller on other devices, but with limited functionality. We are actively exploring the supportability of the controller on additional devices via Bluetooth. This works with all controller-compatible games on Samsung Gear VR. To see if your game is compatible with controllers, check the app description page in the Oculus store. Would you like to contact Support regarding the "Use your Xbox Wireless Controller on Samsung Gear VR" issue you were reading about or a different issue?